(you can skip the presentation of the composer and go directly to the discographies, of Camerata’s original 11-CD series “Compositions of Isang Yun”, of the 2009 reissue on 9-CDs “The Art of Isang Yun”, of the 10-CD series published by the Intenational Isang Yun Society, to the other CDs in my collection, and to the CDs I’m still missing). Isang Yun (1917-1995) seems to be suffering the fate of many composers when they die – especially when they are stylistically independent composers, rather than leaders or members of a compositional “school” (Michael Tippett, or the French André Jolivet and the Spanish/French Maurice Ohana, here come to mind): he tends to be forgotten. Well, I hope it doesn’t last too long, because Yun was one, in my opinion, of the greatest and most original composers of the second half of the 20th Century, especially in his later years when he let his lyrical vein take over. Yun’s early works are rooted in the most thorny and gnarled style of the German avant-garde of the time, but in the late 1970s and early 1980s he invented a unique and uniquely beautiful style, combining those advances of the avant-garde and the melismatic traditions of Chinese and Korean Court music. A lot of his music then takes place in the upper reaches, often sounding like some wild aviary from outer space. His music is never “easy-listening”, saccharine and sentimental as it often is with the neo-tonal, neo-simplistic, neo-mystical minimalist composers that carved out a niche in the 1980s and 1990s, but if you have the ear to hear it, it is achingly beautiful, all the more so as its lyricism is entirely exotic. On the face of this, the well-known anecdotes from Yun’s life – that he was a South-Korean supportingh North-Korea and an advocate of the re-unification of the two countries, that in 1967 he was abducted in Berlin by the South-Korean secret services (South Korea was then a dictatorship), tortured and sentenced to life in prison and owed his recovered freedom only to the international protest that ensued, that he established in Germany and acquired German citizenship and never went back to South Korea thereafter -, as important as they were back then in shaping his emotional and compositional outlook, are now of no great importance. When I started posting reviews on Amazon.com a decade ago, one of the objectives I set to myself was to review all the music of Yun I had in my collection and so expound my love and fascination for his music. Well, ten years later, I’m far from there yet – too much vying for attention and listening time. But hopefully, creating my own website will give me a new kickstart. 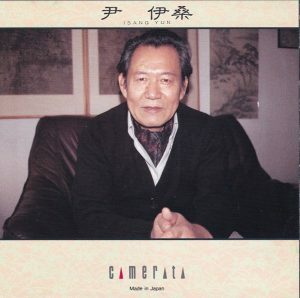 The Japanese label Camerata did great service to the admirer of Yun’s music when they issued, between 1987 and 1997, an 11-CD survey of his music, a series called “Compositions of Isang Yun” (the first installments were first released on LP in the early 1980s, and the last volume, released some years after the others, wasn’t numbered as part of the series and was only titled “Last works of Isang Yun”), and this is how I have them. In 2009 they reissued their Yun collection on a 9-CD series titled “The Art of Isang Yun”, and did some reshuffling on the occasion. In the original series, the pairings were rarely entirely consistent, mixing orchestral and chamber, and various performers. The reissued series is genre-centered, with three volumes of orchestral, two volumes of concertos, and the remainder of chamber and instrumental music. Also, stacking the contents of the original eleven CDs on only nine, each offers more generous timings, almost always over 70 minutes, while those of the original series ran to about 60-minutes each, and sometimes even less, especially volumes 1-3 which were straight reissues from LP. This is the only one don’t have from the series, but it is the same recording as on Cpo 999 047-2, which I have. It was reissued on Art-3. Clarinet Quintet on Art-7 with the contents of “Last Works”, and the rest on Art-9 with the addition of the Sonatina from Compositions-3. Compositons of Isang Yun-10: Symphony No. 2, Symphony No. 4 “Singing in the Dark”. Bavarian Radio SO, Georg Schmöhe, Tokyo Metropolitan SO, Hiroyuki Hiwaki. Camerata 30CM-226 (1995). CMCD-50024 Art of Isang Yun vol. 1 (Orchestral Works I): Symphony No. 1 (from Compositions-6), Muak – Tänzerische Fantasie (from Compositions-3). EMG / Essential Media Classical 4942856 “Chamber Music: World Premiere Recordings” (Königliches Thema for solo violin, Clarinet Quintet No. 1, Piri for clarinet solo, Duo for cello and harp, Rencontre for clarinet, harp and cello). Wilanow String Quartet, barcode 0894231398322. It is very badly listed (those works can’t be played only by the Wilanow String Quartet), I don’t know what that EMG / Essential Media is, I’ve found one website that said that it was a “manufactured-on-demand” CD and that had more detailed credits, and it turns out that it is a reissue from Col Legno AI 31 808 CD (see above). Better go to the source. I have the Camerata 10-disk “Compositions” set and appreciate your sorting out the “Art” disks. I recently acquired the cpo performance of “My Land” and “Exemplum” thinking they were different performances from the Camerata and was surprised to learn they are the same. This seems odd to me, was there a contractual reason for two different labels issuing the same performance? I’m wondering if you have any insight into this. No I have no special insight on why Cpo published the same recording as Camerata, but Camerata’s distribution being very much limited to the Far East (it is a Japanese label), it is customary for a label distributed only in one part of the world or one country to license their recordings to another label distributed in another part of the world. Since cpo had an ongoing Yun series, it isn’t entirely surprising that they would have licensed that recording from Camerata. On the other hand the rest of the cpo Yun recordings are purely cpo’s. A good source on all those details is the website of the Isang Yun Gesellschaft, International Isang Yun Society. They confirm (together with the fact that the cast is exactly the same) that both editions are the same recording. You’ll find the link at the end of this Isang Yun composer page. I’ve now listened to both the Camerata (from the 10-disk Compositions collection) and the CPO disk and can report that the CPO disk is pitched noticeably higher — and the track speeds are shorter (“Exemplum” is 20:00 on CPO and 20:43 on Camerata — the same goes for “My Land,” the CPO disk is pitched higher and the timings for each movement are shorter). This would suggest that this is an analog recording that was mastered at a slower speed on Camerata and a faster speed on CPO. I’m in the process of tracking down a copy of the score so I can confirm what the pitches are supposed to be — assuming that the orchestra was tuned to A440, this may help us determine which CD better represents the performance. If before I was curious, now I am fascinated — perhaps someone realized that the initial CD release was mastered at the wrong speed and corrected it for the later issue. I’m primarily a jazz collector and I’m well aware that old recordings from the 78 era have been digitized at different pitches — the more scholarly labels make a point of “pitch-correcting” their recordings, that is, altering the speed until the pitch conforms to A440, in an effort to reproduce the recording at the correct tempo. (Of course if the band’s tuning was sharper or flatter than A440 then such an adjustment would be erroneous.) Famously most LP issues of the classic Miles Davis album “Kind of Blue” had side B mastered too fast — later CD issues have corrected this and people who grew up with the LP may find the second half of the CD slower than they’ve grown used to. Anyway, I have much less experience as a collector of “notated” (classical) music, so I don’t know if this is a common issue with late-20th C. analog recordings! I’ve just written to my correspondent at the Internationale Isang Yun Gesellschaft to inquire about this. Stay tune. As for your general comment about pitch issues when transferring old recordings, yes, this is famously known in Classical music too. The old Boston Symphony Orchestra under Koussevitsky is one of the famous cases – Boston pitch was very high, but modern transfers neglect that. A related point is that, when you played LPs on your turntable (and I suppose the same was true with 78s, but I’ve never dealt with them), they never, in my experience, ran at correct pitch. I don’t know if it was a problem with the way tapes were transferred to LP, or with the revolving speed of turntables. I suspect in fact the latter, and I suspect that the fact that electricity in Europe is at 50Hz while it is 60 in the US may be a factor. This is just conjecture on my part, I’m not an electronician. Anyway, when you played LPs on your turntable, your were pretty sure you weren’t running exactly at proper pitch. AND the fact that, when the stylus approaches the end of the groove, where the revolutions are shorter, pitch changed as well. Using basic softwares like Audacity, I’ve transferred myself some old LPs and adjusted speed and pitch, taking my clue, sometimes in the timings indicated by the LP, sometimes based on pitch.. I can tell you that the speed increase to raise pitch a mere semi-tone makes A HELL of a difference. It entirely changes the character of the interpretation and music ! And the effect on voices is even more radical. It’ls change a mezzo into a soprano, and a sensuous soprano into a girlish soprano.